Johan Elmander's first goal this season set the seal on a hard-fought extra-time victory for Bolton over West Ham in the third round of the Carling Cup. Herita Ilunga had poked in at the far post to put the Hammers 1-0 up and that was the score with four minutes left. But Kevin Davies stooped low to direct a fine header in to take the game into extra time, before Gary Cahill crashed in a fine goal to put the hosts ahead. And Elmander tapped in for the first time since December to seal the win. Although the Premier League remains the priority for Bolton, the victory provided a welcome confidence boost after a sketchy start to the season, while for West Ham it is a seventh failure in eight years to reach the fourth round. See what happens when you play 4-4-2 Megson! It looked like being very different, however, when Ilunga poked in his first senior goal for West Ham after the hosts failed to clear Alessandro Diamanti's poorly-hit corner. The goal had come against the run of play, and Bolton's pressure at set-pieces in particular finally told in the 86th minute when Davies headed in Matthew Taylor's whipped cross. That sent the match into extra time, and Taylor almost won the match four minutes into the first period only for his 25-yard free-kick to rebound off a post with keeper Robert Green well beaten. Cahill did put Bolton 2-1 up, though, when he smashed home from outside the penalty area. Diamanti hit the crossbar with a left-footed curling shot nine minutes from the end, but that was the closest West Ham came as Elmander added the decisive third late on to wrap up a deserved victory. 120:00+1:46 The match has ended. 119:53 Fabrice Muamba concedes a free kick for a foul on Alessandro Diamanti. James Tomkins restarts play with the free kick. 118:06 The assist for the goal came from Chung-Yong Lee. 118:06 GOAL - Johan Elmander:Bolton 3 - 1 West Ham Johan Elmander gets on the score sheet with a goal from close in to the bottom left corner of the goal. Bolton 3-1 West Ham. 117:19 Effort from deep inside the area by Johan Elmander misses to the left of the goal. 116:43 Alessandro Diamanti takes a shot. Save by Jussi Jaaskelainen. 114:25 The ball is sent over by Julien Faubert. 113:19 Shot from just outside the box by Johan Elmander misses to the left of the target. 112:24 Free kick awarded for a foul by Fabrice Muamba on Radoslav Kovac. Robert Green takes the free kick. 110:51 Shot by Alessandro Diamanti. 108:23 Kevin Davies fouled by Julien Faubert, the ref awards a free kick. Direct free kick taken by Kevin Davies. 107:24 Unfair challenge on Gary Cahill by Carlton Cole results in a free kick. Direct free kick taken by Gary Cahill. 107:03 Johan Elmander takes a shot. Robert Green makes a save. 105:47 Free kick awarded for an unfair challenge on Kevin Davies by Bondz N'Gala. Free kick crossed by Matthew Taylor. Johan Elmander crosses the ball, blocked by Bondz N'Gala. Inswinging corner taken from the right by-line by Matthew Taylor. 105:36 Julien Faubert produces a cross, Samuel Ricketts manages to make a clearance. 105:01 The second half of extra time begins. 105:00+0:36 Unfair challenge on Julien Faubert by Chung-Yong Lee results in a free kick. Free kick crossed left-footed by Alessandro Diamanti. 104:07 Matthew Taylor produces a left-footed shot from the edge of the box and misses to the left of the goal. 103:31 The assistant referee flags for offside against Alessandro Diamanti. Jussi Jaaskelainen takes the free kick. 101:49 Effort from 30 yards by Fabrice Muamba. Save made by Robert Green. Outswinging corner taken by Matthew Taylor from the left by-line, Gary Cahill takes a shot. Save made by Robert Green. 101:35 Chung-Yong Lee crosses the ball, clearance made by Jonathan Spector. 101:04 Free kick awarded for an unfair challenge on Scott Parker by Tamir Cohen. Direct free kick taken by Scott Parker. 98:00 Alessandro Diamanti produces a left-footed shot from just outside the box that goes wide left of the target. 97:36 Foul by Tamir Cohen on Alessandro Diamanti, free kick awarded. Herita Ilunga restarts play with the free kick. 95:40 GOAL - Gary Cahill:Bolton 2 - 1 West Ham Goal scored by Gary Cahill from outside the area to the bottom left corner of the goal. Bolton 2-1 West Ham. 94:51 Foul by Mark Noble on Kevin Davies, free kick awarded. Free kick crossed left-footed by Matthew Taylor from right wing, clearance made by James Tomkins. Corner from left by-line taken by Matthew Taylor. 93:14 Direct strike on goal from the free kick comes in from Matthew Taylor. 93:14 Booking Booking for Scott Parker for unsporting behaviour. 93:09 Scott Parker challenges Tamir Cohen unfairly and gives away a free kick. 91:15 Inswinging corner taken by Matthew Taylor from the right by-line, clearance made by Scott Parker. 90:00+4:59 Normal time is of over and the game goes into extra time. 90:00+3:22 Mark Noble takes the inswinging corner, save by Jussi Jaaskelainen. Julien Faubert takes a shot. Zat Knight gets a block in. 90:00+2:32 A cross is delivered by Julien Faubert. 90:00+1:20 Foul by Tamir Cohen on Julien Faubert, free kick awarded. Free kick crossed right-footed by James Tomkins from right wing, clearance made by Gary Cahill. 89:28 Alessandro Diamanti sends in a cross, blocked by Samuel Ricketts. Corner taken by Mark Noble played to the near post, clearance by Zat Knight. 88:29 Samuel Ricketts delivers the ball, Close range header by Kevin Davies goes over the crossbar. 87:29 Substitution Julien Faubert comes on in place of Zavon Hines. 87:05 Free kick awarded for a foul by Matthew Taylor on Jonathan Spector. Robert Green takes the direct free kick. 85:33 Assist on the goal came from Matthew Taylor. 85:33 GOAL - Kevin Davies:Bolton 1 - 1 West Ham Kevin Davies finds the net with a headed goal from close in. Bolton 1-1 West Ham. 83:37 Johan Elmander takes a shot. Blocked by Bondz N'Gala. Outswinging corner taken by Matthew Taylor. The ball is crossed by Fabrice Muamba. 83:10 The ball is delivered by Samuel Ricketts, save by Robert Green. 82:53 Inswinging corner taken left-footed by Matthew Taylor played to the near post, clearance by Carlton Cole. 81:58 Alessandro Diamanti delivers the ball in from the corner. 81:19 Free kick taken by Robert Green. 81:19 Substitution Tamir Cohen comes on in place of Gavin McCann. 81:19 The assistant referee flags for offside against Johan Elmander. 80:04 Centre by Matthew Taylor, blocked by James Tomkins. 79:33 Mark Noble is flagged offside by the assistant referee. Free kick taken by Jussi Jaaskelainen. 76:55 Matthew Taylor takes a shot from 25 yards. Blocked by Bondz N'Gala. Inswinging corner taken left-footed by Matthew Taylor, Robert Green makes a save. Inswinging corner taken left-footed by Matthew Taylor played to the near post, clearance by Bondz N'Gala. Inswinging corner taken left-footed by Matthew Taylor, save by Robert Green. 76:14 Substitution Johan Elmander joins the action as a substitute, replacing Ivan Klasnic. 75:39 Matthew Taylor takes a shot. Robert Green makes a comfortable save. 74:13 Free kick taken by Samuel Ricketts. 74:13 Substitution Kieron Dyer goes off and Carlton Cole comes on. 74:13 Free kick awarded for a foul by Bondz N'Gala on Chung-Yong Lee. 73:26 The offside flag is raised against Zavon Hines. Jussi Jaaskelainen restarts play with the free kick. 68:43 Substitution Ricardo Gardner leaves the field to be replaced by Chung-Yong Lee. 67:25 Shot from just outside the box by Alessandro Diamanti goes over the bar. 66:32 Kevin Davies has an effort at goal from outside the box which goes wide right of the goal. 63:29 Gavin McCann challenges Herita Ilunga unfairly and gives away a free kick. Scott Parker crosses the ball from the free kick right-footed from right channel, Matthew Taylor makes a clearance. Samuel Ricketts fouled by Mark Noble, the ref awards a free kick. Direct free kick taken by Samuel Ricketts. 62:31 Substitution (West Ham) makes a substitution, with Bondz N'Gala coming on for Manuel Da Costa. 62:03 Gavin McCann takes a shot. Radoslav Kovac gets a block in. 59:32 Kevin Davies fouled by Manuel Da Costa, the ref awards a free kick. Free kick crossed by Matthew Taylor. 58:07 Alessandro Diamanti provided the assist for the goal. 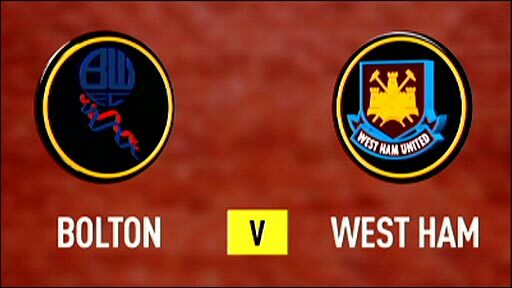 58:07 GOAL - Herita Ilunga:Bolton 0 - 1 West Ham Goal scored by Herita Ilunga from inside the six-yard box to the bottom left corner of the goal. Bolton 0-1 West Ham. 56:52 Free kick awarded for a foul by Fabrice Muamba on Zavon Hines. Alessandro Diamanti has a direct shot on goal from the free kick, blocked by Ivan Klasnic. 56:19 The ball is crossed by Matthew Taylor. 55:33 Matthew Taylor delivers the ball, clearance made by Jonathan Spector. Inswinging corner taken from the right by-line by Matthew Taylor, Herita Ilunga makes a clearance. 54:23 The assistant referee flags for offside against Kieron Dyer. Free kick taken by Jussi Jaaskelainen. 53:58 Jonathan Spector produces a cross, Zat Knight makes a clearance. 53:05 The ball is swung over by Jlloyd Samuel. 50:57 A cross is delivered by Ricardo Gardner, Herita Ilunga manages to make a clearance. Matthew Taylor crosses the ball, blocked by Herita Ilunga. Matthew Taylor produces a cross, save by Robert Green. Corner taken right-footed by Gavin McCann. 50:00 Ivan Klasnic is flagged offside by the assistant referee. James Tomkins restarts play with the free kick. 48:27 Free kick awarded for an unfair challenge on Alessandro Diamanti by Ricardo Gardner. Free kick taken by Jonathan Spector. 47:15 Free kick awarded for a foul by Kieron Dyer on Ricardo Gardner. Free kick crossed by Jlloyd Samuel, save by Robert Green. 46:23 Ivan Klasnic takes a shot. Save by Robert Green. Inswinging corner taken from the right by-line by Matthew Taylor, save by Robert Green. 45:00+1:05 The whistle is blown to end the first half. 45:00+0:19 Effort on goal by Alessandro Diamanti from 35 yards went harmlessly over the target. 42:32 Radoslav Kovac gives away a free kick for an unfair challenge on Ricardo Gardner. Matthew Taylor produces a shot on goal direct from the free kick. Inswinging corner taken by Matthew Taylor, clearance by Jonathan Spector. Ricardo Gardner takes a shot from just inside the penalty box which clears the bar. 41:57 A cross is delivered by Ivan Klasnic, blocked by Herita Ilunga. Inswinging corner taken by Matthew Taylor from the right by-line. 41:21 The ball is sent over by Manuel Da Costa. 39:14 Header from close in by Kevin Davies misses to the right of the goal. 36:56 Zavon Hines takes a shot. Gary Cahill gets a block in. Outswinging corner taken from the right by-line by Mark Noble, clearance made by Gary Cahill. The ball is swung over by Herita Ilunga. 36:02 Foul by Jlloyd Samuel on Alessandro Diamanti, free kick awarded. Free kick taken by Jonathan Spector. 35:08 The official flags Kieron Dyer offside. Jussi Jaaskelainen restarts play with the free kick. 34:25 A cross is delivered by Kieron Dyer, Jussi Jaaskelainen makes a save. Short corner taken by Mark Noble. 32:48 Unfair challenge on Gary Cahill by Scott Parker results in a free kick. Gavin McCann restarts play with the free kick. Kevin Davies is caught offside. Free kick taken by Robert Green. 32:18 Short corner worked by Matthew Taylor. 31:22 Fabrice Muamba fouled by Kieron Dyer, the ref awards a free kick. Free kick crossed left-footed by Jlloyd Samuel from left wing, Herita Ilunga makes a clearance. 29:49 Free kick awarded for a foul by Jlloyd Samuel on Herita Ilunga. Robert Green takes the free kick. 29:42 Jlloyd Samuel produces a cross, Herita Ilunga gets a block in. 28:07 The ball is delivered by Ricardo Gardner, Ivan Klasnic takes a shot. Save by Robert Green. Inswinging corner taken from the right by-line by Matthew Taylor, clearance made by Jonathan Spector. 22:13 Foul by Samuel Ricketts on Zavon Hines, free kick awarded. Scott Parker restarts play with the free kick. 20:58 Mark Noble has an effort at goal from outside the area which goes wide left of the target. 19:01 Short corner taken by Alessandro Diamanti from the right by-line. 18:25 Foul by Scott Parker on Matthew Taylor, free kick awarded. Gavin McCann takes the direct free kick. 17:23 Scott Parker fouled by Gavin McCann, the ref awards a free kick. Scott Parker restarts play with the free kick. Manuel Da Costa crosses the ball. 15:49 Unfair challenge on Kevin Davies by Manuel Da Costa results in a free kick. Free kick crossed by Matthew Taylor, clearance made by Radoslav Kovac. 13:40 Zavon Hines takes a shot. Save made by Jussi Jaaskelainen. Inswinging corner taken by Alessandro Diamanti from the right by-line played to the near post. 11:40 Kevin Davies fouled by Scott Parker, the ref awards a free kick. Matthew Taylor takes the free kick. The ball is crossed by Samuel Ricketts, Zat Knight takes a shot. Save by Robert Green. Corner taken right-footed by Gavin McCann from the left by-line, James Tomkins makes a clearance. Inswinging corner taken from the right by-line by Matthew Taylor. Handball decision goes against Kevin Davies. Direct free kick taken by Robert Green. 10:50 Foul by Ivan Klasnic on Radoslav Kovac, free kick awarded. Radoslav Kovac takes the free kick. 8:30 Kieron Dyer fouled by Gavin McCann, the ref awards a free kick. Mark Noble has an effort direct from the free kick. 7:41 Samuel Ricketts crosses the ball, Herita Ilunga gets a block in. Matthew Taylor takes a short corner. 6:19 Radoslav Kovac takes a shot. Jussi Jaaskelainen makes a save. 5:11 Matthew Taylor produces a right-footed shot from just outside the box that goes wide right of the target. 3:45 Unfair challenge on Alessandro Diamanti by Ricardo Gardner results in a free kick. Robert Green takes the free kick. 2:08 Corner taken short by Kieron Dyer, Alessandro Diamanti takes a shot. Save by Jussi Jaaskelainen. Scott Parker has an effort from just inside the box that misses to the left of the goal. 1:37 Short corner worked by Alessandro Diamanti, Alessandro Diamanti takes a shot. Save made by Jussi Jaaskelainen. 0:22 The ball is swung over by Kevin Davies, Herita Ilunga gets a block in. Inswinging corner taken by Matthew Taylor from the right by-line, clearance made by Scott Parker. Ricardo Gardner takes a shot. Herita Ilunga gets a block in.